Officers were stepping up to help buy a gardener new tools after his truck was stolen, along with his rent money, cellphone, and equipment, making what could have been a heartbreaking story one of goodwill. Adrian Salgado had started his first gardening job of the day at a gated community in the area of Bristol Street and Memory Lane Wednesday morning. 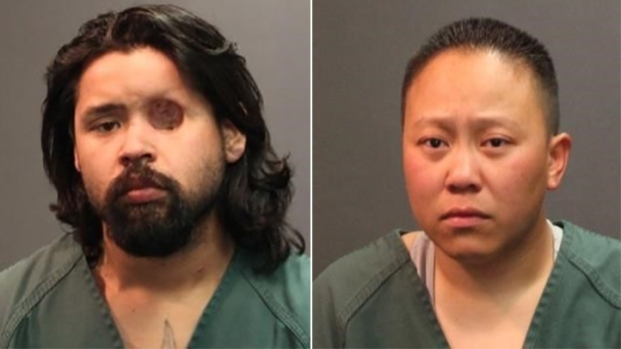 The suspects, later identified as Alan Babauta, 22, and Caroline Nguyen, 31, by Santa Ana Police Cpl. Anthony Bertagna, were accused of stealing Salgado’s truck, along with $1,000 of his rent money. Salgado said it takes about three months of work to earn that much, as he works a couple days a week. His daughter called the police when he arrived home, and started tracking her father’s cellphone in the “Find My iPhone” app. “I felt bad for him because that’s hard work,” his daughter, Diana Reyes, said. Santa Ana police were able to ultimately track the two suspects down in Garden Grove, finding them with $500 each in their pockets. By then, all the tools were gone. Because the suspects claimed the money belonged to them, the police had to enter the cash as evidence, meaning Salgado wouldn’t be getting it back. They returned the truck to Salgado, but when asked how he would make ends meet, he said he didn’t know. That’s when officers, Patrolmen’s Benevolent Association, and Home Depot all stepped up. Santa Ana officers donated $500, the officers’ union donated $500, and Home Depot donated $100 so Salgado could take a shopping spree, and buy new equipment. “They don’t have to do this but they’re doing it our of the kindness of their hearts,” the victim’s daughter, Lizbeth, said. Because some of the officers are miltary members, they got a discount on the lawnmower, weedwacker, and other tools.